As antique and collectable pottery enthusiasts, we tend to spend a lot of time thinking about old potteries - many of which are now defunct. Although there are a few survivors - Royal Doulton, for example - most of the names we revere are no more. You can imagine our pleasure, therefore, in discovering a real British pottery that is still alive and well and uses traditional techniques to make top quality garden wares. To celebrate this discovery, we thought we would devote this edition of the newsletter to Errington Reay, a real, live British pottery. Errington Reay is based in Bardon Mill, near Hexham, Northumberland. Founded by Robert Errington and William Reay in 1878, the pottery made a name for itself producing domestic and sanitary wares. Since then, Errington Reay has gradually focused on traditionally-made garden wares. 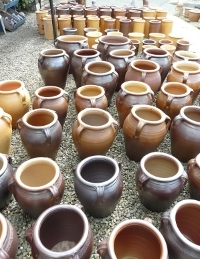 These include pots of all shapes and sizes, cast animals and pottery-based water features - all of which are a cut above typical garden centre offerings. 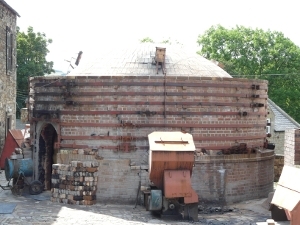 All of the pottery's wares are hand thrown, hand moulded or cast using traditional methods. Most of Errington Reay's wares are salt glazed. This provides a tough, textured and very attractive finish that's ideal for outdoor use. Some of the wares are glazed instead - with glazes that bring to mind early 19th century Doulton - rich, dark blues and greens. The quality seems excellent and everything is guaranteed frost proof for 10 years. Errington Reay seems to be stocked in a number of garden centres and can also be bought online, from the pottery's website. However, if you are in the area, I would definitely recommend a visit to Bardon Mill. The pottery has a factory shop with a large selection of both first and second quality wares - the latter offering great savings on the first quality prices. 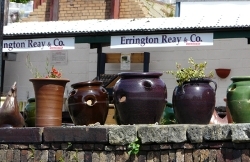 Errington Reay's wares are clearly very popular with locals - walking around Haltwhistle, we saw countless gardens in which there were several Errington Reay pots - easily recognisable from pavement distance! 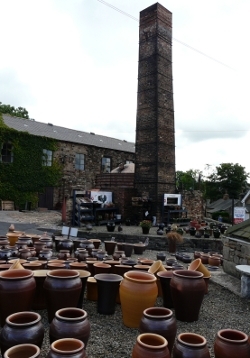 The Errington Reay pottery at Bardon Mill is very close to the Northumbrian section of Hadrian's Wall and also to Haltwhistle and Hexham. If you are in the area, why not pop in?